Our exclusive new Cloud technology a.k.a.Remote Operation has the best of both Cloud and data hosted locally. This makes it faster and more secure. You have control over your data and you can even make your own backups. This feature is perfect for Multiple Locations, When you Travel, Sidewalk Sales, Trade Shows & Sales Events, and even on your sales floor when your wireless network is not available, reliable, or fast enough. Local data is the best option for one location with one or more stations. Unless… you want to work from home or another physical location. Data is stored on one of your computers and shared across your local wired or wireless network. Wired is still best. Backups may be made to a cloud service, portable drive, or other local location. We have solutions for various situations and we can help you explore your options… give us a call. M U L T I S I T E F E A T U R E S – Multiple Sales / Warehouse locations on independent networks. R E M O T E S T A T I O N S – Artisan users that are home or out in the field. Take Artisan Station with you when you are away. Each “Node” uses it’s own set of numbers for Sales, PO’s, etc. Smart merging technology allows for changes to the same records and fields at the same time and handles duplicates. Data sending and receiving happens behind the scenes without interrupting your sales or work. A dedicated team to assist with setup and maintenance. FAST – Utilizes Local Data which is the Fastest. 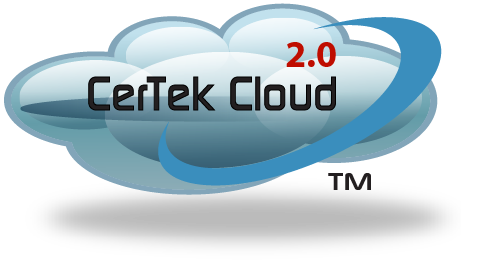 CerTek Cloud 2.0 Data can be Shared on Local Network so only one Node is needed at each location or site. CerTek does NOT store a full copy of your data on our Cloud Servers.